The Oakland Raiders were undefeated at 3-0 as they traveled to Buffalo to take on the Bills on October 6, 2002. The Raiders had a first-year head coach in Bill Callahan, elevated from offensive coordinator following the departure of Jon Gruden, who had led the club to back-to-back division titles. Former journeyman QB Rich Gannon had blossomed in Oakland, directing a pass-oriented attack that included veteran wide receivers Tim Brown and Jerry Rice plus the far younger Jerry Porter. Small but highly effective RB Charlie Garner led the ground game and also was a proficient receiver out of the backfield. The defense had a smattering of proven veterans along with rookie CB Phillip Buchanon (pictured above) added to the mix, who would be filling in for injured star CB Charles Woodson against Buffalo. The Bills, coached by Gregg Williams, were a revamped team coming off a disastrous 3-13 year in 2001. The biggest change had been at quarterback, where Drew Bledsoe had been obtained after nine years in New England. He had fine wide receivers in Eric Moulds and Peerless Price and second-year RB Travis Henry was showing promise. There was a crowd of 73,038 at Ralph Wilson Stadium. The teams traded punts until late in the first quarter as the Raiders put together a 10-play, 60-yard scoring drive. Along the way, they converted three third downs, most notably with a pass from Rich Gannon to Tim Brown for 17 yards to the Buffalo 43 in a third-and-six situation and a 24-yard run by Gannon on a third-and-10 play. The series ended with Gannon throwing to Joey Porter for a 29-yard touchdown. In a possession that extended into the second quarter, Buffalo responded by going 80 yards in 11 plays. Drew Bledsoe completed six passes along the way including a two-yard toss to Peerless Price for a TD. Mike Hollis added the extra point to tie the score at 7-7. With the offenses now asserting themselves, Gannon immediately threw to Jerry Rice for a 33-yard gain on the first play of the next series. Two plays later, Charlie Garner took off for a 35-yard gain down the middle and two plays after that Gannon ran around end to score a touchdown from a yard out. Sebastian Janikowski added another extra point and Oakland was up by 14-7. The teams kept up the scoring pace. A big penalty on the Raiders moved the ball to their 39 on Buffalo’s next play from scrimmage and from there Bledsoe tossed three straight completions, including one to WR Josh Reed for 38 yards. TE Dave Moore gathered in a two-yard scoring pass and, with Hollis adding the PAT, the score was again knotted at 14-14. However, Oakland came right back, needing just five plays to cover 75 yards. Gannon threw to Porter for 25 yards and Garner ran to his right for a 36-yard touchdown that put the visitors back in the lead. Buffalo finally had a series end with a punt and Oakland did so in turn. With 1:32 remaining in the half, the Bills, seemingly pinned down at their two yard line following a Shane Lechler punt, marched 98 yards in five plays. The big ones were three straight completions by Bledsoe (pictured below), to Price for 14 yards and again for 54 yards, and to FB Larry Centers for 25 yards to the Oakland five. From there, Centers carried for a touchdown, Hollis added the extra point, and the game was tied at 21-21 at halftime. Buffalo took the second half kickoff and drove 62 yards in nine plays. Bledsoe completed three passes and Travis Henry ran effectively before the Bills were finally forced to kick a field goal and Hollis was successful from 30 yards. The home team was on top for the first time at 24-21. 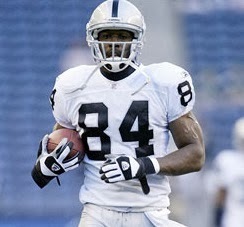 A short series by the Raiders ended with a punt, but on Buffalo’s next play Bledsoe was intercepted by CB Tory James. Starting at the Bills’ 32, the Raiders took five plays to regain the lead on a one-yard touchdown carry by FB Zack Crockett. Janikowski’s PAT made the score 28-24. The Bills responded by driving 80 yards in eight plays. Bledsoe was successful on five passes, including one to Eric Moulds in a third-and-three situation that gained 22 yards to the Oakland two. From there, Henry ran for a TD and, with Hollis adding the extra point, the Bills were back in front by 31-28. That remained the tally as the game entered the fourth quarter. Early in the period, the Raiders came through with a big play as, facing second-and-15 at their own 31, Gannon connected with Garner for a 69-yard touchdown. Janikowski added the PAT to again make it a four-point game with the visitors in the lead. It seemed as though the back-and-forth nature of the game would continue as the Bills responded by moving methodically into Oakland territory. Bledsoe completed passes of 19 yards to Price, 17 yards to Reed, and 13 yards to Moulds and, following a two-yard carry by Henry, Buffalo was at the 27 yard line. But on the next play, CB Phillip Buchanon intercepted a Bledsoe pass and returned it 81 yards for a touchdown. With the extra point added, it put Oakland ahead by 11 points and proved to be the key play of the game. Bledsoe was sacked twice as the Bills went nowhere on their next series. Following the punt, the Raiders padded their lead in just four plays, the last two Gannon throws to Porter for 36 yards and to Rice for a 20-yard touchdown. Buffalo put together one last desperation drive that ended with James intercepting a Bledsoe pass at the Oakland seven to effectively finish the contest. The Raiders came away with a 49-31 win. Oakland had the edge over the Bills in total yards (495 to 479) while Buffalo had more first downs (29 to 24). The Bills turned the ball over three times, to none by the Raiders, and Oakland sacked Bledsoe five times while Buffalo’s defense got to Gannon just once. The Raiders were also flagged for 10 penalties, at a cost of 120 yards, as opposed to 7 for 43 yards called on the Bills. Rich Gannon completed 23 of 38 passes for 357 yards and three touchdowns with none intercepted. Charlie Garner rushed for 94 yards on just 8 carries that included one TD and gained another 83 yards on four pass receptions that included the one long score (although he was injured on the play and didn’t return). Jerry Porter (pictured at right) caught 7 passes for 117 yards and a touchdown while Jerry Rice and Tim Brown each had four receptions, for 77 and 55 yards, respectively. For the Bills, Drew Bledsoe went to the air 53 times and had 32 completions for 417 yards and two TDs, but also three interceptions. Eric Moulds caught 8 of those passes for 112 yards and Peerless Price gained 126 yards and scored a touchdown on his 7 receptions. Travis Henry gained 58 yards on 15 rushing attempts that included a score and also caught 7 passes for 47 yards. After getting off to a 4-0 start, the Raiders lost their next four games but won seven of eight to finish the season at 11-5 and atop the AFC West for the third consecutive year. However, after winning the AFC Championship they were beaten badly by Tampa Bay in the Super Bowl. Buffalo, on the other hand, won three straight games after the loss to the Raiders but then collapsed during the second half of the season. The Bills broke even at 8-8 to place at the bottom of the AFC East. Rich Gannon had a MVP year as he led the NFL in pass attempts (618), completions (418), and yards (4689) and ranked second in completion percentage (67.6) and passing overall (97.3 rating). Charlie Garner rushed for 962 yards and caught 91 passes for 941 more yards to rank fifth in the league in yards from scrimmage (1903). 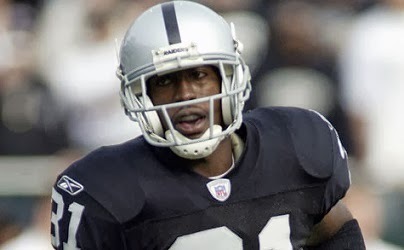 While Tim Brown and Jerry Rice remained the featured receivers, Jerry Porter had 51 catches for 688 yards (13.5 avg.) and nine touchdowns. 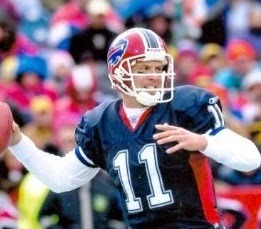 Drew Bledsoe placed second to Gannon in pass attempts (610) and yards (4359) and was chosen to the Pro Bowl. Travis Henry also was picked after rushing for 1438 yards and so was Eric Moulds, who finished with an even 100 catches for 1292 yards and 10 TDs. Peerless Price didn’t go to the Pro Bowl but had a career year in which he caught 94 passes for 1252 yards and 9 scores.